Any aquarium system needs to fall within a certain set of parameters in order to be successful. What's less well understood is that every species of fish coral and invertebrate also has specific needs. Matching your system to these needs and matching them to each other is the key to setting up a successful ecosystem and giving your aquarium a long and healthy life. 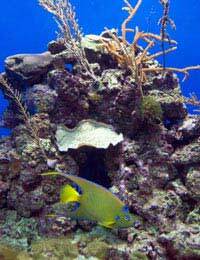 The first and most obvious factor in a tropical aquarium is temperature. Proper monitoring and control of temperature is essential to running a successful aquarium. Whilst most fish are happy at around 24-25ºC, individual species vary quite a bit. Water which is too cold can lead to sluggishness and ill health whilst water which is too hot can cause suffocation. Make sure you have the equipment necessary to adjust the temperature of your aquarium water to suit your fish, and don't keep fish which need different temperature water together. You should know from the outset whether you want a marine aquarium or a freshwater aquarium, but there are also degrees in between, with several species of fish preferring a brackish environment. It's important to get the salinity (or specific gravity) of the water right for your fish. Many species which prefer brackish water are quite delicate and will suffer from ill health if they have too much or too little salt in their environment. You should always make sure you're using proper marine salts to adjust the salinity of your aquarium water, as ordinary salt doesn't contain all the elements which marine fish need - it's just sodium chloride, whereas marine salt also contains potassium, magnesium and calcium. Even in a freshwater aquarium there is salt present in the water, and this is left behind when water evaporates, so over time the salinity of the tank will increase. This is one reason why it's important to do regular partial water changes. You may also find a salty line developing around the edges of the tank at the surface of the water. This can be easily scrubbed off and removed. Each species of fish has a particular preference for the pH, or acidity, of the water in which it lives. Getting this right is important to fish health and affects which species of fish you can keep together. Some popular tank decorations, such as bogwood and certain types of rock, can affect the pH of the water. The natural biological cycle of your aquarium involves the production and breaking down of ammonia, nitrites and nitrates. These chemicals can be toxic to fish, with some species being more sensitive than others. Make sure that you're aware of the particular needs of the fish you're keeping and adjust your filtration accordingly. Besides the products of the nitrogen cycle, your fish can be sensitive to many other pollutants in their water. Different species vary in their tolerance of poor water quality, but you should always aim to keep your tank well filtered and to maintain a regular cleaning regime. Use a commercial aquarium water conditioner to treat any new water you add to the tank.Water quality can be complicated by the presence of corals, which prefer an environment rich in organic nutrients. In this case you should make sure that you have a filtration system which removes problematic compounds without killing the micro-organisms which enable a reef to thrive. Once you have established a good set of water parameters for your aquarium, it's important to keep them stable - sudden changes can be just as problematic for your fish as having the wrong conditions to begin with. Choose your fish carefully so that they'll be happy in the environment you've created, and use a thermometer and an aquarium water test kit to monitor conditions in the tank on a frequent basis. This may sound daunting, but it's all quite simple once you get the hang of it. With patience, you'll soon find it comes naturally, and your fish will thank you for it.